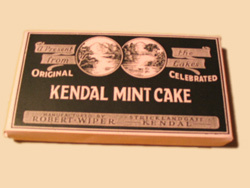 Period type label for Robert Wiper's original, celebrated Mint Cake. An ideal energy-giving present for those in the trenches. "As supplied to The Admiralty, The Crown Agents and Shakleton's (ill fated) 1914 British Imperial Trans-Antarctic Expedition".